It all started when I was nominated for the BLOOOM Award by Warsteiner in 2018. I didn't get on the shortlist but was offered a coaching session at Art Düsseldorf. This sounded like a good idea, although I didn’t know what to expect. On Saturday November 17th I took the train from Arnhem to Düsseldorf. 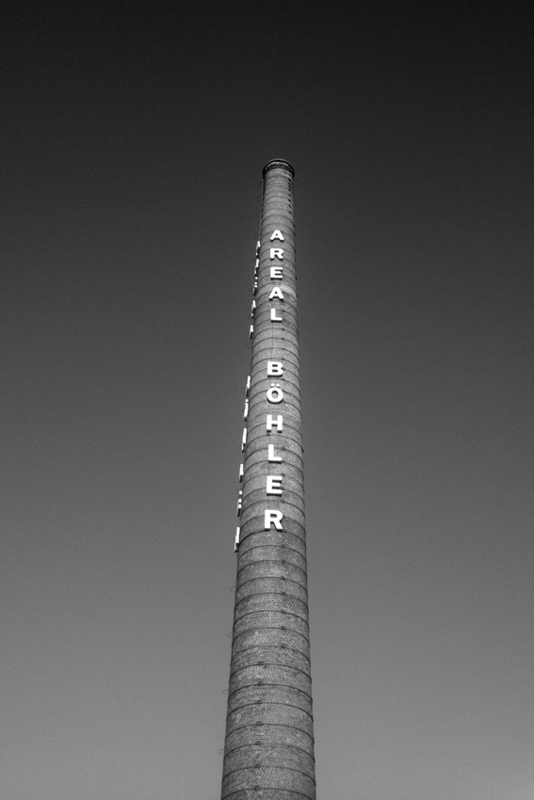 I arrived a few hours before the coaching session and found my way to Areal Böhler. The sun was shining, and I was full of expectations. I followed the crowd across the terrain to the entrance. Fig1. - Areal Böhler in Düsseldorf. Upon my arrival I was greeted by the security and received a VIP card at the reception. It was easy to navigate the space and find my way to the BLOOOM Award section. When I got there, I was the first one, but the staff reassured me that I was in the right place. So, I waited, and was soon joined by a man in a suit. He sat down next to me and we started to talk about the weather. Shortly after I found out he was Stephan Berg, director of Kunstmuseum Bonn. We were joined by a lively young lady, Johanna Keimeyer and waited together for a third person that didn’t come. At noon Stephan decided to start the coaching session. He asked us to pitch issues that we are struggling with and said that we can talk separately another time. His proposition to come for a meeting in Bonn sparked my interest. Furthermore, we had an insightful conversation. Fig2. 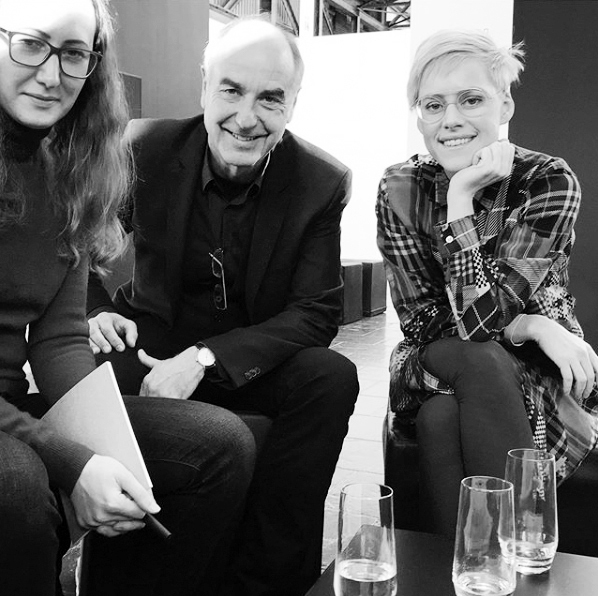 - Yelena Myshko with Stephan Berg and Johanna Keimeyer. There were a lot of similarities in the issues me and Johanna brought forward. For example, both of us print our work and wondered about the right size and edition, as well as the price. We are emerging artists starting to sell work. I mentioned that there is a lot of money to be made from posters. Stephan remarked that selling posters should be a deliberate choice. We also talked about gallery representation versus self-promotion. The talk was quick but insightful. The hour went by and another group of nominees were waiting for their coaching session. We parted with Stephan after exchanging business cards. Then Johanna insisted on taking pictures together. She was joined by a photographer who gave in to her requests for different set-ups. It was fun while it lasted, but soon Johanna rushed off to visit a museum before catching her flight back to Berlin. When I was on my own again, I decided to check out the fair. I walked around and scanned the gallery lots without much excitement until I stumbled at gallery Bastian that was exhibiting the work of Joseph Beuys. I couldn't contain myself! His work was so relatable and inspiring. This was the first time I’ve seen it live. Fig3. - Joseph Beuys, Ohne Titel, 1971. Bastian even had the iconic felt suit! But I was mostly in love with the green violin, because I have an idea for a project inspired by the green screen. The fact that it's been done before doesn't stop me, in fact I'm confidently treading in the footsteps of Joseph Beuys. Besides the green violin, I could relate to the framed round objects. I'm fascinated by circles and use them a lot in my work too. At the bookstore I encountered more work by Joseph Beuys and bought a DVD of a documentary about him. There, I got into a conversation with artist Jutta Muller who said that she had known Joseph Beuys. At first, I was perplexed by his presence in Düsseldorf, but I later discovered that Joseph Beuys lived and worked there during the prime time of his life. So, it's obvious that his legacy is strong in Düsseldorf. That day, I rediscovered Joseph Beuys as a muse and realized that I’m connected to him in many ways.